It’s back! The once-maligned GMC Canyon compact light-duty pickup returns to the small-truck wars for the 2015 model year to challenge Toyota’s legendary Tacoma and Nissan’s no-nonsense Frontier. This time, however, Jimmy has up-powered and improved fuel economy in its mini-trucks with a couple of brand new engines and a more aerodynamic profile. 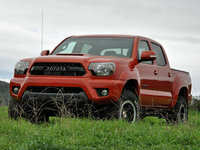 They’ve also added a slew of first-in-class techno-gizmos and, perhaps more importantly, they’ve paid attention to the fact that truck owners want a little cabin posh, too, and have added a slew of high-end interior materials and bling in the expectation that this ex-postscript pickup will at last give its domineering Japanese competitors a good fight. Meanwhile, look for the 2015 Canyon to come in 3 trim levels, the Base, the midlevel SLE and the top-shelf SLT. Only the 6-seat Extended cab and the roomier 6-passenger Crew cab configurations return for this go-around, with Extended cab iterations offering only a 6-foot bed and Crew cab trims available with either the 6-foot bed or a more compact though less practical 5-foot bed. Although still delivered with standard rear-wheel drive (RWD), an improved part-time 4-wheel drive system (4WD) is again optional. A few further additions to the next-gen Colorado lineup include a sporty new front fascia and grille, a more aerodynamic profile and available grille shutters that close at highway speeds. Look for a new-for-2015 2.5-liter inline 4-cylinder (I4) powerplant to mate with the introductory 6-speed shiftable automatic transmission for 193 hp and 184 lb-ft of torque. Meantime, the RWD Extended cab Base trim can be delivered with an available (and also new) 6-speed manual transmission, while Jimmy claims that this new 4-banger will garner far better fuel numbers than the last generation Canyon’s 26 mpg highway with either gearbox. Need more oomph? For 2015, this pint-size pickup is slated to offer an available 3.6-liter V6 engine that again mates with the 6-speed automatic for 302 hp and 270 lb-ft of torque. 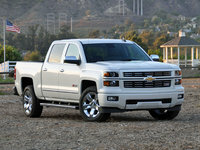 GM claims towing capacity with a properly equipped V6-toting Canyon will, at over 6,700 pounds, exceed that of the vaunted Tacoma. When the new Canyon goes on sale in the fall of 2014, check out such further expected debuts as a standard rear-view camera, copious upgraded interior materials and workmanship and LED-outlined headlights. Updated options, meantime, should include 4G LTE Wi-Fi capability, improved IntelliLink infotainment with a new 8-inch touchscreen display, and a downsized version of the EZ-Lift tailgate that presently graces the Canyon’s hefty Sierra kinfolk. It’s anticipated, furthermore, that all this will be in addition to such traditional bling, for instance in the 2015 Canyon SLE, as 16-inch alloy wheels, power-adjustable outside mirrors, premium cloth upholstery, cruise control and a tilt-adjustable steering wheel. Also look for standard air conditioning in this mid-level variant, as well as OnStar Directions and Connections technology, Bluetooth hands-free calling and a single-CD player with 6 speakers and satellite radio. Of course the Base version will doubtless offer less than its midlevel sibling, with the flagship SLT adding even more stuff. Additional options, meantime, are expected to include a spray-in bedliner and, in 4WD variations, GM’s new Autotrac automatic transfer case with auto-locking rear differential and descent control. Other available add-ons to the 2015 Canyon lineup should include auto climate control, full power accessories and GPS navigation. Finally, standard safety equipment slated to adorn this resurgent light-duty pickup includes 4-wheel antilock disc brakes (ABS), traction and stability control, front and rear head airbags and daytime running lights. A post-collision safety system is again delivered in all trim levels, while the SLE and SLT should also flaunt standard front fog/driving lights. What's your take on the 2015 GMC Canyon? 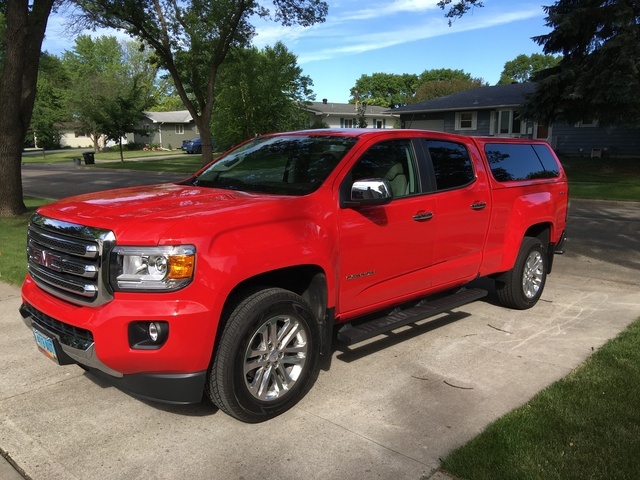 Users ranked 2015 GMC Canyon against other cars which they drove/owned. Each ranking was based on 9 categories. Here is the summary of top rankings. 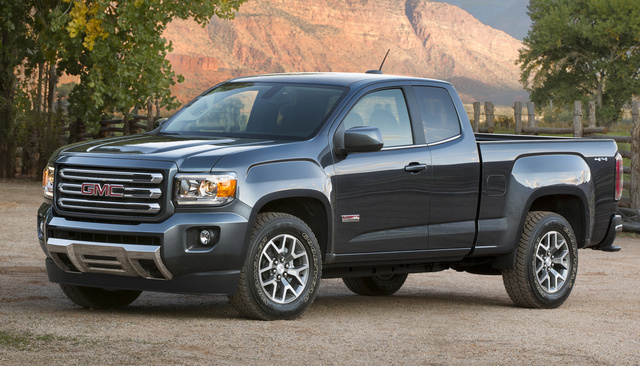 Have you driven a 2015 GMC Canyon?